This festive pudding is just the thing to round off a Burns' Night supper around the time of the Scottish poet's birthday on 25 January. Cranachan used to be served chilled in Scottish farmhouses or sometimes frozen into an ice cream. Scottish Heather Honey is a rich reddish-amber with a jellied consistency and a sultry taste of burnt caramel that evokes summer on the moorlands. It goes hand in hand with oatmeal, whisky and raspberries. Andre Guepratte's Raspberry Coulis is used instead of raspberries for its intense flavour, although any raspberry coulis will do. Heat a dry frying pan over a medium heat and toast the oatmeal, stirring constantly until it smells nutty and is just beginning to change colour. Transfer the oatmeal to a plate and set aside to cool for a couple of minutes. Whisk the cream with the whisky and 2 tbsp of the honey in a bowl until it forms soft peaks. 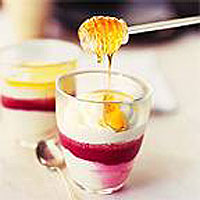 Assemble the pudding in a glass trifle bowl or individual glass dishes. Begin by spreading a third of the cream over the base, drizzle over a third of the coulis and scatter over a third of the toasted oatmeal. Repeat these layers with another third of the ingredients, and then very carefully smooth the remaining cream over the top of the dessert. Cover with clingfilm and chill in the refrigerator for several hours. Just before serving, drizzle over the remaining honey and raspberry coulis, and lightly scatter over the toasted oatmeal. If you can't find pinhead oatmeal,the alternative is to sift medium oatmeal through a sieve. Doing this will separate out the fine dust and coarse pinheads. Use the pinheads in the dessert and carefully return the remaining dust to the pack.